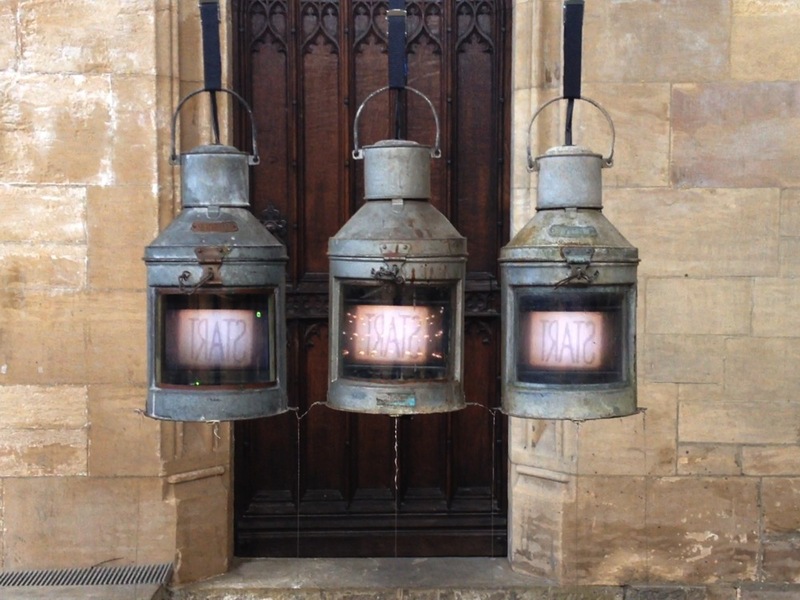 Synchronized video in suspended lamps. From “Ordinalia” by Tracey Holland. I have been working on a documentation video (as yet unfinished) of some of the installation of artist Tracey Holland’s “Magnetic Atlas” exhibition at 20-21 in Scunthorpe UK. Actually, my involvement was not documentation but technical advice and configuration for the audio-visual elements of the show, and you can see me in the video also doing some of the physical installation. For me, the brief started out quite straightforward but developed into a real technical challenge in the end. I’ve known Tracey for a long time but have never worked with her before. I’ve always liked her work and it embodies what my ambition is for my own work, to make art that has both beauty and meaning and can be approached in a number of ways. When we first talking about my involvement in this project, it was just a bit of advice on the audio-visual equipment that would play back Tracey’s video inside custom-made enclosures to be hung in the 20-21 gallery. However, when it cam to the final spec, two sets of three screens needed synchronized three-channel video and this put a very different complexion on the whole job. What’s more, one of the triple-screen works was to be hung from several meters up. In the foreground, Tracey Holland, the artist, & Dominic Mason of 20-21. 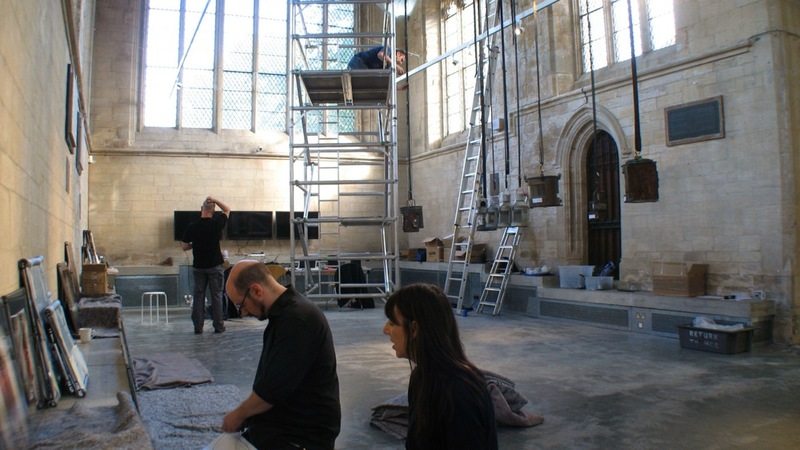 The venue’s technician, Frank, is up the scaffold tower, and I’m the one in the background scratching his head. Those of you who have worked with multi-channel video will understand that to go from multiple single channels of video to multiple SYNCHRONIZED channels is not just a little extra work, it’s a whole order of magnitude increase in complexity. I’m not going to go into the subtleties of it in this post but will write an additional post that discusses the technicalities, strictly for the geeks. After much thought and discussion, we decided to implement all the video playback using Raspberry Pis because they are low-cost, low-power and can playback Full HD video at 25 frames-per-second. There are lots of media players on the market but the domestic versions are a bit of an unknown quantity and cannot usually be synchronized. 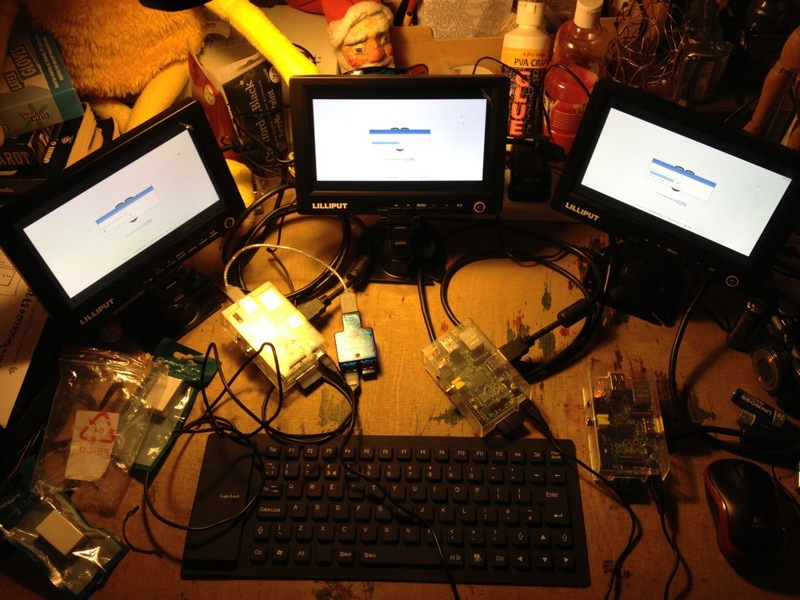 My Raspberry Pi & Lilliput multi-screen test bed. I would have to admit to a being a bit too confident with something I had only limited experience with, and the RasPis were very fiddly to set up, especially seeing as not all the lamps needed the level of sophistication available. However, they proved me to be correct about the reliability and flexibility of Linux and the Raspberry Pi hardware platform. 20-21 is an amazing place to be showing your work in. It’s a converted church, but not the damp and gloomy space you might think. It’s very well-endowed, warm and dry, with multiple exhibition spaces, offices, café and education rooms, and the character of the building has been preserved. The staff are exceptionally helpful although the team seemed very small to run such a busy programme and large building. They seem to do a lot of overtime. 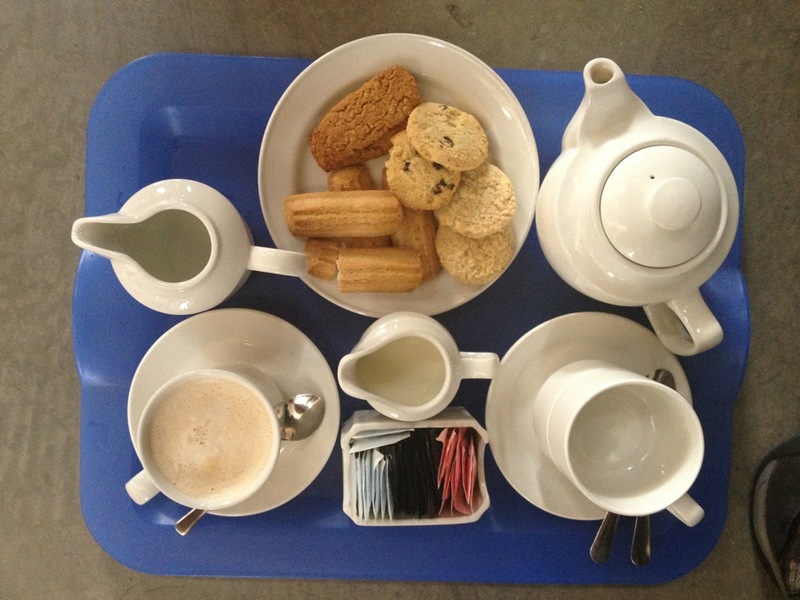 Tea and biscuits during installation, courtesy of 20-21. Unfortunately, due to the ambitious nature of the work and the limited installation time, we didn’t finish for the opening day but the public were very forgiving. I have worked with a lot of artists and Tracey is one of the most rewarding people I have ever worked for. Despite many stresses, frustrations and setbacks, she was always a pleasure to be with. We laughed a lot and there was no shouting or bitter recriminations. At least, not yet. The show continues at 20-21 until 18th 11th January 2014 and I highly recommend you see it before it finishes.